In search of a good netbook for myself, I was looking at the Asus Eee 1000HE for a while. When it came to Turkey and was displayed on the shelves, I was there on the first day to give it a thorough look. I must say that it is an exceptional netbook in today’s market. 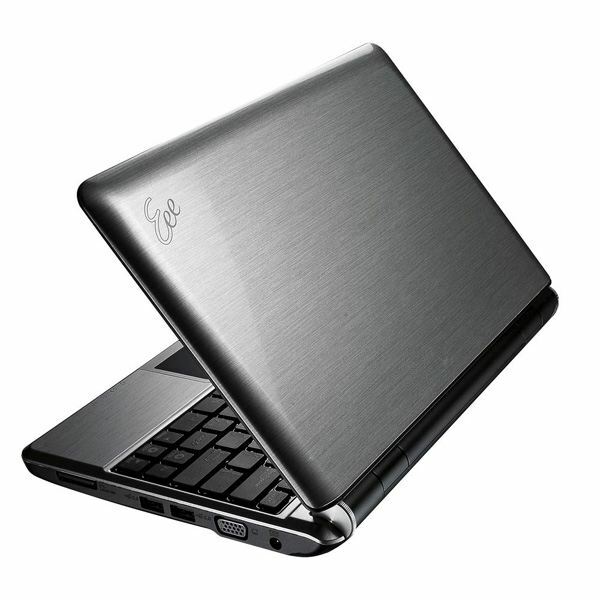 The netbook has a glossy finish behind and around the screen and around the keyboard. The Eee logo on the back of the screen is grey, giving it an another elegant look. The quality is very nice, but due to the glossy finish, it is a real magnet for fingerprints and dust particles. Don’t worry though: Asus included an antistatic cloth to clean the netbook. They get a bonus point for such a little but lovely thought. As an Asus tradition, the cloth bag to place your netbook inside also comes inside the box, saving you a couple of dollars to buy yourself one. It is not a bag to carry your Eee though; it is just a good fit to place your netbook inside and place it into another bag to avoid scratches and other unpleasant damage to your Eee. Eee 1000 HE sports a 10” matte display. It is readable under direct sunlight and you will have no problems with even a small shade. It is crisp and does not tire the user. I personally believe that matte displays are better suited for the users who use office software (text processing, spreadsheets, databases) and browse the Internet, whereas the glossy screens are better suited for graphics, photo and CAD/CAM editing, where vibrant colors are needed more. After working on this netbook all day long, you are unlikely to complain about the screen. For the graphics, Asus used Intel’s 945 GME graphics adapter and it is plenty sufficient – unless you want 1080p Full HD movie playback in your netbook. But you can safely play your DVD-quality movies without any problems and it can handle your 720p movies as well. This is the best thing you can do with the Intel’s graphics cards (which they push to the manufacturers) and Asus did go for the best. Given Intel’s view on netbooks and netbook graphics, this is really among the top you can get. There are few netbooks in the market that come with Intel’s Atom N280 processor and 1000 HE is one of them. Atom N280 is clocked at 1.66 Gigahertz, compared to 1.6 Gigahertz for N270 processors, but the difference is not the 0.06 Gigahertz (well this difference is in fact equals to 60 Megahertz, and people who used Pentium 60 processors will have a small smile) but rather the bus speed which is 667 Megahertz, compared to the 533 Megahertz in Atom N270. This increase in the bus speed makes Eee 1000HE work faster. The main memory (RAM) included in the 1000HE is 1GB, but maximum supported is 2 GB in a single slot. I strongly recommend to purchase a 2GB RAM stick and upgrade your netbook before you leave the electronics shop. The hard drive gives you 160GB of storage (the model I have looked at has a Momentous hard disk) plus 10GB of free Eee Storage, summing up to 170 GB. This should be enough to take your documents, photos and music to wherever you go. Asus Eee 1000HE supports a wonderful chicklet keyboard, having a very small key travel distance. This short travel distance makes typing very easy and fast. Personally I have bigger-than-average hands and I did not have any problems or any typos after 10 minutes of typing on the Eee 1000 HE. The size of the keyboard is 92% of an original keyboard. But I will take one point off from Asus here, since the key labels are affixed to the keys. In this era, I would like to see Asus pay a little bit more attention to the details and used laser engraved keys to have a long-lasting look. This would be a marginal contribution to the unit’s costs and I would be happy to pay $5 for the upgrade. 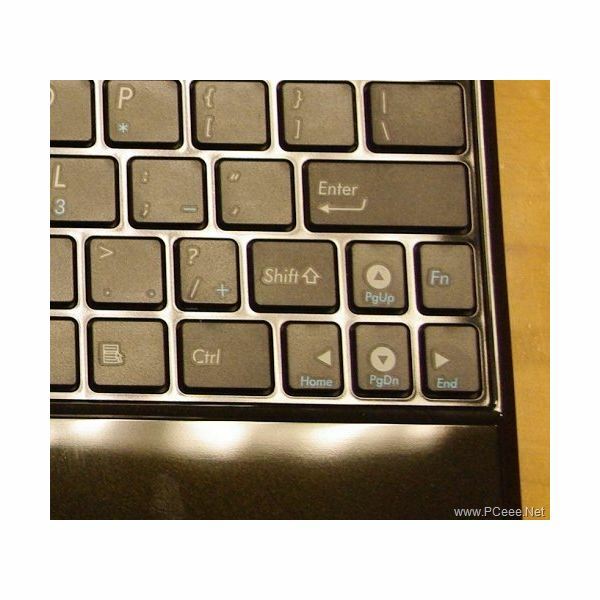 The touchpad is a typical touchpad and the left and right clicks are visually separated by a thin slit. This physical detail avoids accidental left/right clicks. The touchpad can be disabled by the Fn-F3 key combination temporarily; you can use Fn-F3 to restore. The touchpad is not very sensitive and failed to realize some of my clicks. I had to use the buttons instead of tapping on the touchpad. The right side has an SD/MMC card slots, two USB 2.0 slots, a VGA-out, DC In connections from front to back. The left side has earphone, microphone, one USB 2.0 slot, RJ-45 Gigabit Ethernet port and a Kensington Lock, again from front to back. There are no connections at the back and in the front. The in-built microphone (“array microphone” as Asus puts it) has two “receivers”, located at the bottom of the screen. The bluetooth is in-built and the wireless adapter is Realtek 2860 b/g/n. During my use, I found the wireless adapter’s reception very good, close to excellent. The audio chipset is Intel’s ICH7 High Definition adapter. Although I personally checked a lot of notebooks with this adapter and liked the sound (I am not an audiophile though) with good speakers. Asus included a seemingly cheap speakers with 1000 HE, located at the bottom, which deliver a “tinny” sound. If you do not play with your media player’s equalizer and give the basses a boost, the speakers perform well even the sound output is maxed. If you give a little bass boost and then crank up the volume however, the speakers will begin to fail. The camera has 1.3 Megapixel resolution, located at the top of the screen. In terms of netbooks and notebooks this is the top resolution that you will get so there is nothing to say here. The camera is of nice quality, the images even in the low-light conditions are acceptable. Asus’s new battery is Lithium-Ion type with an exceptional 8700 mAh capacity. Theoretically the netbook can provide about 9.5 hours of battery life, but with normal usage (where you will have Wireless on and screen brightness at high levels) you can expect to have something around 7 hours of use – almost enough for your all-day-computing. Considering the netbook average of 4.5 – 5 hours, this means almost an 50% increase. Asus opened the netbook scene with Linux and then recently put up a website named “It’s better with Windows.” Although I’m not too happy with this, Asus offers no alternative except Windows XP SP3 with 1000 HE. There is a 60-day evaluation of Microsoft Office and the Eee Storage program. Unlike other netbooks (like HP and Sony’s products), this one is not loaded with excessive crapware, so you will not have to go through any lengthy cleanups. Asus Eee 1000 HE comes with a USD 375 price tag from Amazon.com. The warranty is 1-year limited and for U.S. customers there is 7/24 phone support. I believe this is the best netbook that is available for sale in the market today. Asus has placed a lot of nice things here and there on the device, such as one-click access to Skype, one customizable key for a program of your choice, scrolling through various resolutions and various performance levels (Super High, Reduced and Power Saver). With all the items we have seen above, I cannot see any competitor against 1000 HE. It is a little bit heavy (something less than 1.5 kilograms) but this is not something too much to consider if we are talking about netbooks with 1.35 kilograms against 1.5 kilograms. I will be happy to carry the additional 150-200 grams without complaining.